A news article stated that explosions from Mount Cameroon were observed by tourists who were in the area on 3 February. The tourists reported hearing strong explosions followed by observations of "flames" and ash. Introduction. The Associated Press reported a sudden explosion had occurred at Mount Cameroon on 3 February 2012 (see subsection below). A review of MODVOLC thermal alerts based on satellite infrared data during 2001 to mid-2014 found few if any of the highest-level alerts. In contrast, there were numerous stronger alerts during 3 March to 17 July 2000 (activity described in BGVN 24:09, 25:06). In (BGVN 26:11) we reported that during 26-27 June 2001, Limbe, an economically important coastal town with ~85,000 residents located on the S foot of the steep sided stratovolcano Mt. Cameroon (figure 4), was struck by a series of heavy rains leading to deadly floods and landslides. Figure 5 shows a photo taken in Limbe during the flood. Although many would classify the flood as a meteorological disaster and not a volcanological one, Mt. Cameroon is the tallest peak in Western Africa and orogenic uplift of warm most air over the massive edifice is a factor affecting the amount of rainfall. Limbe sits at the mouth of drainages coming down this side of the edifice. During July 2014, heavy rains again resulted in floods in Limbe (Ndaley, 2014). In strict eruptive-hazard terms, Mount Cameroon is the only volcanic peak in Western Africa with recent ongoing eruptions. Figure 4. (Inset) Indicating the location of the Republic of Cameroon in Africa. (Main map) The location of Mount Cameroon, the main bulk of which is centered ~25 km from the coastline. Some other regional volcanic features and their ages are also indicated. Etinde is a prominent conical volcanic center on the SW flank of the larger structure of Mount Cameroon. The town of Limbe resides along the coast just S of the volcano. Taken from Suh and others (2008). Figure 5. Flooding that inundated Clerks quarter, Limbe in 2001. The volcanic topography feeds a number of catchment basins into Limbe, which is also why the same town is also highly vulnerable to lava flows (Wantim and others, 2011). Photo taken from MIA-VITA literature. This report discusses recent research on the 2000 eruption of Mount Cameroon and then summarizes news articles on a smaller 2012 explosion. After that, this report discusses vulnerability studies, including a United Nations project that examined and attempted to mitigate the risk to local communities. The 2000 eruption. On the basis of first-hand knowledge of some of their co-authors, Wantim and others (2011) stated that the eruption occurred during 28 May and 20 July 2000. MODVOLC satellite-based thermal alerts were found during the interval 3 March 2000 to 17 July 2000. The seismic activity for this eruption lasted 3 months, up to September 2000 (Ateba and others, 2009). Multiple fissure segments produced lava that built four different lava flow fields at three sites they specify in their paper (Wantim and others, 2011). Eruptions at site 1 (~ 3,930 m a.s.l) began in the night of 28 May 2000 with an explosive phase that produced only tephra and ballistic blocks (Suh and others, 2003 and Wantim and others, 2011). A ~850 m-long ′a′a flow field was emplaced at this site a month later, an observation supported by data from MODVOLC and multispectral images (Landsat ETM + and ASTER) analyzed in this study. The upper 2000 flow is one of the shortest (850 m) recorded for historical lava flows here despite having descended steep slopes (10-25°). Late emission of the lava and field observations of cone breach at the lava source suggest that the lava flow was fed by the drainage of a transient lava lake. That lake was presumably formed by lava fountaining in the eruptive cone (Wantim and others., 2011). The lava flow field covers a total surface area of (8 ± 2) × 104 m2 with a total volume of (3.4 ± 0.8) × 105 m3. There were two lobes, ~4.5 m and ~8.7 m thick (Wantim and others., 2011). Brief explosion--2012 news reports. Cameroon state radio and television reports stated that Mount Cameroon sent "ashes and flames" into the air in a brief explosion on 3 February 2012. A violent explosion lasted a couple of seconds and lightly injured two of the porters and guides on the mountain, according to a 6 February 2012 Associated Press report. Lava flow hazard and risk, and weathering studies. According to Favalli and others (2010), Mt. Cameroon is one of the most active effusive volcanoes in Africa. About 500,000 people living or working around its fertile flanks are subject to significant threat from lava flow inundation. Therefore, this group initiated a scientific project to assess the hazards/risks associated with the volcano by simulating probable lava flow paths using the DOWNFLOW code, a routine that for lava-flow-hazard mapping that defines areas susceptible to inundation. According to Wantim and others (2013), as for many other effusive volcanoes, only limited information exists on the relevant lava flow properties and emplacement dynamics for recent eruptions. This study provides new quantitative constraints for rheological and dynamic characteristics of lava flow effusion at Mount Cameroon during the 1982 and 2000 eruptions. These constraints were used to calibrate the FLOWGO thermo-rheological model for these lava flows. FLOWGO (Harris and Rowland, 2001) was the only model that enables full inversion of the thermo-rheological properties of lava flows. It can be constrained from channel morphology and down-flow evolution of crystal content. Lava flow hazard and risk were assessed by simulating probable lava flow paths using the DOWNFLOW code (Tarquini and Favalli, 2011). That code incorporates digital elevation data and allows the definition of areas that are susceptible to inundation by lava flows originating from each vent; it has been used extensively to simulate lava flows at Mt. Etna and Nyiragongo volcanoes ( Favalli and others, 2005, 2006, 2009; Chirico and others 2009). The details of the modeling and the resulting maps they produced can be found in the cited references. Simulated lava flows from about 80,000 possible vents were used to produce a detailed lava flow hazard map. The lava flow risk in the area was mapped by combining the hazard map with digitized infrastructures (i.e., human settlements and roads). Results show that the risk of lava flow inundation is greatest in the most inhabited coastal areas, specifically the town of Limbe (which constitutes the center of Cameroon's oil industry and an important commercial port). Buea, the second most important town in the area, has a much lower risk although it is significantly closer to the summit of the volcano. Non-negligible risk characterizes many villages and most roads in the area surrounding the volcano. In addition to the conventional risk mapping described above, the authors also present (1) two reversed risk maps (one for buildings and one for roads), where each point on the volcano is classified according to the total damage expected as a consequence of vent opening at that point; (2) maps of the lava catchments for the two main towns of Limbe and Buea, illustrating the expected damage upon venting at any point in the catchment basin. The hazard and risk maps provided here represent valuable tools for both medium/long-term land-use planning and real-time volcanic risk management and decision making. The largely geochemical study of Che and others (2012), analyses the behavior and mobility of major and some trace elements during the physical and chemical development of landslide-prone soil profiles in Limbe, SW Cameroon. The soils result from in situ weathering of Tertiary basaltic and picrobasaltic rocks. Textural and chemical characterizations, together with two mass balance models are applied to understand the mobility and redistribution of elements during the weathering of pyroclastic cones and lava flows in the setting of Mt. Cameroon. This weathering is a major factor in the cohesion of steep slopes, and thus these studies address slope stability, another kind of volcano-related hazard that could occur even in times of volcanic quiescence. Socio-economic vulnerability study. A United Nations project, MIA-VITA (Mitigate and Assess risk from Volcanic Impact on Terrain and human Activities) was started in Cameroon during 2011 (Apa and others, 2007; Bosi and others, 2011; European Commission, 2010). (The phrase 'Mia Vita' comes from the Italian, "My Life"). The project was based on the UN International Strategy for Disaster Reduction and a key expected outcome was to finding the best means to help local populations and authorities better perceive risks and thus reduce community vulnerability. The program in Cameroon, as well in three other developing countries with active volcanoes, had several goals: (1) to assess the natural risk to local communities from the selected volcano, based on risk mapping and damage scenarios; (2) to improve crisis management, based on early warning systems and improved communications between government officials and the local populations, and (3) to reduce the vulnerability of populations in the wake of an eruption. Besides Mount Cameroon, MIA-VITA also contributed to similar goals at Mount Merapi in Indonesia, Mount Kanlaon in Philippines, and Mount Fogo in Cape Verde. In the service of local citizens facing volcanic hazards, the MIA-VITA study also aimed to improve civil-defence, planning, and coordination and to reduce rumors and alarmist information. MIA-VITA also integrates GIS capability with an analytic hierarchy method that yields volcanic risk maps. The approach is designed to solve complex multiple criteria problems using relative pairwise comparisons (Saaty, 1996; Wikipedia, 2014). To apply this approach, it is necessary to break down a complex unstructured problem into its component factors. The method incorporates both qualitative and quantitative criteria in the evaluation. Suh, C.E., Luhr, J.F., and Njome, M.S., 2008, Olivine-hosted glass inclusions from Scoriae erupted in 1954-2000 at Mount Cameroon volcano, West Africa, Journal of Volcanology and Geothermal Research, Volume 169, Issues 1-2, 1 January 2008, pp. 1-33, ISSN 0377-0273, http://dx.doi.org/10.1016/j.jvolgeores.2007.07.004. Wikipedia, 2014, Multi-criteria decision analysis (URL: http://en.wikipedia.org/wiki/Multi-criteria_decision_analysis ). Information Contacts: MODVOLC Thermal Alert System, Hawai'i Instiute of Geophysics and Planetology (HIGP), (Univ. of Hawai'i, 2525 Corrrea Road, Honolulu, HI 96822 USA (URL: http://modis.higp.hawaii.edu/); Mary-Ann del Marmol, Department of Geology and Soil Science, Ghent University, Krijgslaan 281 S8, 9000 Gent, Belgium; Associated Press, and Cameroon Radio Television, CRTV Siège, CRTV Mballa II B.P. 1634, Yaounde, Cameroon (URL: http://crtv.cm/). On 16 October, residents of Buea, ~10 km SE of the summit, were frightened by rumbling sounds and saw a red glow on the W flank. The next day, a helicopter making a survey flight over the area observed an eruption along a fissure ~6.5 km SW of the summit (on the SW border of the terminal plateau, at 4.15°N, 9.13°E). Steam was emitted from the upper part of the fissure, which began at 2,600 m altitude and trended NNE-SSW, parallel to the general tectonic trend. Basaltic lava emerged from the fissure at 2,500 m altitude and moved downslope at 20 km/hour in a 3-m-wide flow that reached forested areas. At night, glow from the lava was visible 50 km away. By 19 October, the active vent had built a cone 20 m high and 50 m in long dimension, and was emitting steam, ash, and lava fountains. Activity fluctuated 20-22 October, with periods of vigorous degassing lasting about 50 minutes. The crater included two active vents that ejected gas, ash, and bombs to 300-400 m height. Short, noisy explosions every 5-10 seconds made talking difficult 200 m from the crater. At 2450 m altitude, a lava flow poured out of the fissure at 20 km/hour. Newspapers reported some slowing of the lava advance during the night of 21-22 October, and by then the lava had moved through heavy rain forest to about 6 km from the seacoast village of Bakingili (population 300) on the SSW flank. Geologists reported that similar vent activity continued 22-30 October, and was audible 15-20 km away. On 30 October, the flow was about 200 m wide and 20 m thick, and its front had apparently stopped at 1,200 m above sea level. However, the eruption was reported to be continuing. Total lava output was estimated at 107 m3. Gas and aerosols were collected by a CNRS team. The eruption plume reached 4,000 m altitude. Total SO2 output was about 1,000 tons/day. At press time, Fitton, Hughes, and Kilburn reported that the moderate lava outflow and Strombolian activity observed 7-8 November had declined to a very sluggish trickle on the 9th, and the eruption had apparently ended 10 November. Most of the 300 inhabitants of Bakingili were evacuated, as were the residents of Tsonko (Isongo), a nearby coastal town. Larger towns and an oil refinery were not endangered by the current activity, but palm oil plantations have reportedly been damaged. Information Contacts: F. LeGuern, D. Polian, CNRS; B. Déruelle, F. Tchoua, Univ. of Yaoundé; Dr. Betah and Dr. Ngungi, Ministère des Mines et Energie, Yaoundé; Drs. Kergomard, Lorfsher, and Rousset, Elf Serepca, Douala; P. Vincent, Univ. de Clermont; Dr. Lonne, Ardic Cameroun Aerienne, Douala; G. Fitton, Univ. of Edinburgh; C. Kilburn, Univ. of London; D. Hughes, Portsmouth Polytechnic; Ambassador H. Horan, U.S. Embassy, Yaoundé; L. Matteson, U.S. Consulate, Douala; British Consulate, Douala; J. Baade and T. Humphrey, Gulf Oil, Douala; R. Shaw, IATA, Montreal; D. Haller, NOAA/NESS; Cameroon Tribune. The upper SW flank fissure eruption that began 16 October ended by 10 November. When French volcanologists departed at the end of October, lava was continuing to emerge from the lower part of the fissure while strombolian activity built a scoria conescoria cone less than 1 km upslope. Between 31 October and the 7 November arrival of British volcanologists, there was extensive landsliding around the lower part of the fissure. An elongate depression had formed, trending radially downslope,~ 500 m long, 200 m wide, and as much as 150 m deep. An estimated 5 x 106 m3 of old lava and pyroclastics moved a maximum of 1.5 km. Lava from later stages of the eruption flowed over and around the debris pile, entering the rain forest 2 km from the vent. When Fitton, Kilburn, and Hughes arrived at the volcano 7 November, activity from the lower part of the fissure had stopped. However, moderate strombolian activity was continuing from the upper part of the fissure, ejecting bombs as much as 50 cm in diameter to 100 m above the rim of the scoria cone, which was 50 m high and 150 m across. Lava flowed from a vent below the SW side of the cone at 2,700 m altitude. The next day, a velocity of 2 m/s was measured in a 2-m-wide flow from the vent. At 2,600 m altitude, this lava formed an aa flow 3 m wide, advancing 1-4 m/s. At the flow front, 1 km from the vent, the temperature of the lava was 1,070°C. On 9 November, lava emission had slowed to a very sluggish trickle and activity at the cone was reduced to gas emission with a period of 5-15 minutes. The eruption had apparently ceased by 10 November. Further Reference. Fitton, J.G., Kilburn, C.R.J., Thirlwall, M.F., and Hughes, D.J., 1983, 1982 Eruption of Mount Cameroon, West Africa: Nature, v. 306, p. 327-332. Information Contacts: G. Fitton, Univ. of Edinburgh; C. Kilburn, Univ. of London; D. Hughes, Portsmouth Polytechnic. Local seismicity at Mount Cameroon significantly increased in early 1993. Before then, an average of 10-12 events/month were recorded. The monthly number of seismic events increased to 20 in January-February 1993 and to 180 events in March (figure 1). The number decreased in April, but rose to 130 in May. The frequency of earthquakes has steadily declined since then, but as of December 1993 had not returned to 1992 levels. Most of these events were centered on the SE flank of the volcano at depths of 30-60 km and had magnitudes of 1-3. This change in seismicity . . . could be a long-range precursor to renewed volcanic activity. Continued monitoring is needed to better assess any temporal migration of hypocenters under the volcano. As of mid-February, only two of the six installed seismographs worked. Figure 1. Seismicity at Mount Cameroon, January 1993-January 1995. Courtesy of ARGV. Although the SE flank is the most seismically active area, this is the first swarm that has been recorded there. Typical SE-flank seismicity consists of one discrete event every 3 days, centered at 40-60 km depth with M 2.8 ± 0.2 (Ambeh and others, 1988). Reference. Ambeh, W.B., Fairhead, J.D., and Stuart, G.W., 1988, Seismicity of the Mount Cameroon region: Journal of African Earth Science, v. 9, p. 1-7. Information Contacts: A. Bekoa and N. Nfomou, ARGV, Buea; Ekodeck G.E. and N. Metuk, IRGM, Yaounde; J. Fairhead, Univ of Leeds. Overall seismic activity was lower in 1994 (240 total events) compared to 1993 (840 events). Most of the 1993 activity was from beneath the SE flank. The monthly number of events was consistently below 30 after October 1993, until December 1994 (figure 1). During 10-12 December a swarm of >40 microearthquakes with a maximum magnitude of 2.5 was recorded at station KBC. Because that was the only operational station, the events could not be accurately located. However, based on the waveform and S-P intervals of ~7 seconds, they were interpreted to be from Mount Cameroon. As of the end of January 1995, seismicity below the SE flank had returned to the 1992 level of 9-12 events/month. During 1996, the average rate of seismicity was 15 events/month, with the exception of January 1996, when a small outburst of 21 events was recorded. Magnitudes were always under 3. Many seismic stations of the local network are out of order and in need of repair, so there is the possibility that other data were lost. However, no event was strong enough to be felt by the population. Information Contacts: Ateba Bekoa and Ntepe Nfomou, IRGM/ARGV, P.O. Box 370, Buea, Cameroon; G.E. Ekodek and J.M. Nnange, IRGM, P.O. Box 4110, Yaounde, Cameroon; J.D. Fairhead, Dept. of Earth Sciences, The University of Leeds, Leeds, LS2 9JT, United Kingdom. Local seismicity in the Mt. Cameroon region has remained consistently low from 1995 through 1997 at an average of 15 events/month (figure 2). An earthquake swarm recorded in January 1996 consisted of 33 events (modified from BGVN 22:02). Another swarm, of 30 earthquakes, occurred in August 1997. All of the recorded signals were A-type volcanic earthquakes under M 3. Many seismic stations remain out of order and in need of repair, so there is the possibility that other data were lost. However, no events were felt by local residents. Figure 2. Monthly seismicity in the Mt. Cameroon region, 1993-97. Note that the number of seismic stations functioning varied over the interval shown. Courtesy of IRGM/ARGV. Information Contacts: Ateba Bekoa and Ntepe Nfomou, IRGM Antenne de Recherches Geophysiques et Volcanologiques (ARGV), P.O. Box 370, Buea, Cameroon; G.E. Ekodek and J.M. Nnange, Institut de Recherches Geologiques et Minieres (IRGM), P.O. Box 4110, Yaounde, Cameroon; J.D. Fairhead, Dept. of Earth Sciences, The University of Leeds, Leeds, LS2 9JT, United Kingdom. During 1993 the Mt. Cameroon region (figure 3) experienced an earthquake swarm. Since then, the frequency of seismic events in the region had remained low, with a mean of 15 earthquakes per month, although some months had more than 30 events (BGVN 23:02). On 26 March 1999, although only one out of a network of six Institute for Mining and Geological Research (IRGM) seismographs was functioning, more than 15 seismic events were detected from the mountain. This increase in seismicity continued on 27 and 28 March, with more than 200 seismic events. Figure 3. Map of part of western Cameroon showing Mt. Cameroon along with some local towns and villages. The Nigerian border (upper left) is indicated by "x" marks. Contour interval is 500 m. Map data for this area is from 1971 or earlier. Around 1930 on 28 March a volcanic eruption began on the S flank at about 2,650 m elevation. According to news reports, earthquakes were felt up to 70 km away from the volcano, in Douala and Kumba, on 29 and 30 March. A second vent opened on the evening of 30 March at ~1,400 m elevation, and sent a voluminous aa flow SSW through dense equatorial forest toward the coastal village of Bakingili. This flow traveled swiftly down the steep upper slopes, but slowed to an estimated 10-25 m/hour on the gentle flanks of the coastal plain. The flow eventually consumed hundreds of hectares of forest and destroyed plantations of palm trees as it moved towards the Atlantic Ocean. News reports noted that by 31 March there were nine vents. Twelve vents were located during an observation trip by a National Scientific Committee on 3 April. The vents were aligned along a pre-existing fracture zone bearing N40°E. At this time the two vents on the SW end were already in fumarolic a post-volcanic phase. The other ten vents exhibited strong explosive activity, emitting gases, lapilli, ash, and incandescent lava blocks. Scoriaceous bombs were ejected 500 m laterally from one vent. The aa lava flows divided into various branches, the largest of which was 3 km long. The lava-flow temperature measured at 300 m from one of the vents was 972°C. The main hazards from this eruption were lava flows and volcanic ash, which was blown SW into villages along the coast. A few eye and respiratory problems were reported among residents. Because of the risk the government decided to temporarily evacuate Bakingili, the village closest to where the lava is expected to enter the ocean. Mount Cameroon, one of Africa's largest volcanoes, rises above the coast of west Cameroon. More than 100 small cinder cones, often fissure-controlled parallel to the long axis of the volcano, occur on the flanks and surrounding lowlands. A large satellitic peak, Etinde, is located on the SW flank. Historical activity, the most frequent of West African volcanoes, was first observed in the 5th century BC by the Carthaginian navigator Hannon. During historical time, moderate explosive and effusive eruptions have occurred from both summit and flank vents. An eruption during February-March 1959 produced a large E-flank lava flow. Increased seismicity was recorded in November 1975, but no eruption occurred. 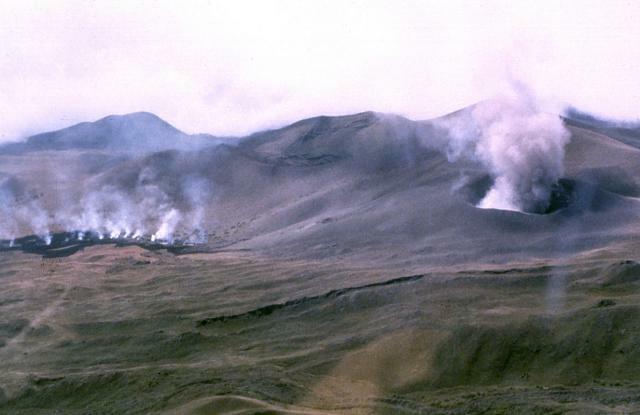 An eruption during October-November 1982 produced lava fountaining from a radial fissure 6.5 km SW of the summit and a lava flow that moved 12 km down the SW flank. Two towns were evacuated, and tephra caused damage to plantations. In 1989 a minor explosive eruption formed a new crater at 2,860 m on the SW flank. The first seismic network was installed in 1984 by the Ekona Unit for Geophysical and Volcanological Research (ARGV) of the IRGM. Information Contacts: B. Ateba, N. Ntepe, J. Nni, and R. Ubangoh, Ekona Unit for Geophysical and Volcanological Research (ARGV), Institute for Mining and Geological Research (IRGM), P.O. Box 370, Buea, Cameroon; J.V. Hell and J.M. Nnange, IRGM, P.O. Box 4110, Yaounde, Cameroon (URL: http://www.irgm-cameroun.org/); J. P. Lockwood and Jean-Baptiste Katabarwa, Geohazards Consultants International, Inc., PO Box 479, Volcano, HI 96785, USA (URL: http://www.geohazardsconsultants.com/), and Office of Foreign Disaster Assistance, U.S. Agency for International Development, 1300 Pennsylvania Avenue NW, Washington, DC 20523 USA (URL: https://www.usaid.gov/who-we-are/organization/bureaus/bureau-democracy-conflict-and-humanitarian-assistance/office-us); Isaha'a Boh Cameroon, Media Research and Strengthening Institute, P.O. Box 731, Yaounde, Cameroon. Following two days of increasing seismicity, on 28 March a volcanic eruption began on the S flank at about 2,650 m elevation (BGVN 24:03). A second set of fissure vents opened on 30 March at ~1,400 m elevation, and sent a voluminous aa flow SSW through dense equatorial forest toward the coastal village of Bakingili. Twelve vents were located during an observation trip by a National Scientific Committee team on 3 April. The upper vents were aligned along a pre-existing fracture zone bearing N40°E. Ten vents exhibited strong explosive activity, emitting gases, lapilli, ash, and incandescent lava blocks. A French group, led by Jacques-Marie Bardintzeff, observed eight small cones (5-60 m high) aligned along the upper fissure during 13-14 April. On the evening of 13 April (1730-1930) four cones were active, three of them emitting white vapor. The NE-most cone was degassing strongly from two vents. At the beginning of the night red glow was visible above this cone, and some incandescent bombs were ejected 200 m high every few minutes. Activity was similar during 0900-1200 on 14 April, except for the NE-most cone, which produced two gray turbulent columns until 1000. Abundant sublimates were seen around each vent, and on a cone towards the SW end of the fissure. Between 9 and 17 April the lava flow from the lower fissure was regularly observed by the French group. The flow, several hundred meters wide and ~10 m thick, was progressing at several meters per hour as blocks collapsed from the front. On the morning of 10 April the front was at 120 m elevation, 600 m from the Limbe-Idenau road near the Atlantic coast, between Batoke and Bakingili. By the evening of 11 April the front, now 150-200 m wide and 30 m thick, had progressed another 30 m with 3-4 m blocks collapsing from it. The flow had slowed on the coastal plain where, according to news reports, considerable damage was done to palm, rubber, and banana plantations. There were conflicting reports on the exact location of the front during 12-13 April, although Isaha'a Boh reported that at mid-day on 12 April lava was still flowing from a crater at ~1,400 m elevation. The French group noted that on the evening of 14 April the 20-m-thick incandescent front was progressing at 7-15 m/hour, and was only 100 m from the road. By the next morning the flow was 5 m from the road. Throughout most of 15 April the front did not progress significantly, but three other lateral lava lobes developed. By 1900 the first incandescent block had fallen on the road, which was completely closed by 2300 that night. During a helicopter flight with the Cameroon volcanological team on 16 April, 100 m of the road was seen by the French group to be covered by a 10-m-thick lava flow. Jack Lockwood and colleagues noted that the last glow from the 1,400-m vent was seen on 14 April, and lava production probably ended about this time. The alkalic basalt lava flow eventually extended 6-7 km from its source and cut the Limbe-Idenau road on 15 April. By then the 10-12-m-thick aa flow was very sluggish; it had ceased all forward movement by 17 April, about 200 m from the coast. Occasional small earthquakes and possible minor volcanic tremor persisted until 22 April. 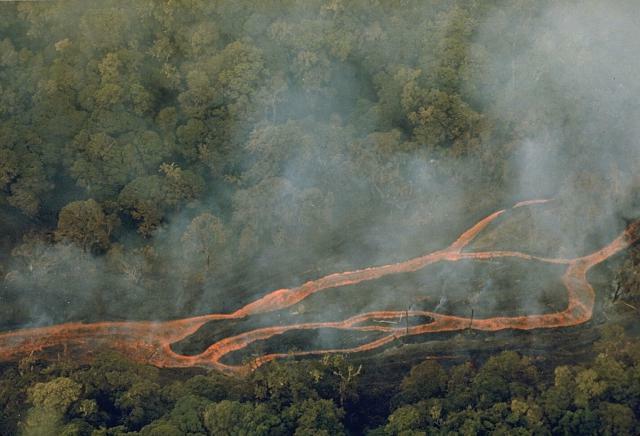 News reports indicated that by 22 April the temperature of the lava flow across the highway had decreased enough that people were climbing over it. The head of the Cameroon scientific team monitoring the eruption, Samuel Ayonge, stated in the press on 20 May that there were still some sporadic earthquakes, and minor fumarolic emissions were still coming from the last two of the 13 craters formed during the eruption, but that eruptive activity had stopped on 17 April. Inhabitants of the W-flank villages of Batoke and Bakingili had been evacuated on 11 April. According to news reports, the villages were not directly threatened by the lava flow, but there was concern over the health risks to residents if the flow entered the sea. The 600 evacuees all returned to their homes during 25-27 May. Information Contacts: J. Nni, Ekona Unit for Geophysical and Volcanological Research (ARGV), Institute for Mining and Geological Research (IRGM), P.O. Box 370, Buea, Cameroon; J. P. Lockwood and Jean-Baptiste Katabarwa, Geohazards Consultants International, Inc., PO Box 479, Volcano, HI 96785, USA (URL: http://www.geohazardsconsultants.com/), and Office of Foreign Disaster Assistance, U.S. Agency for International Development, 1300 Pennsylvania Avenue NW, Washington, DC 20523 USA (URL: https://www.usaid.gov/who-we-are/organization/bureaus/bureau-democracy-conflict-and-humanitarian-assistance/office-us); Jacques-Marie Bardintzeff, Laboratoire de Petrographie-Volcanologie, bat. 504, Universite Paris-Sud, 91405 Orsay, France; Henry Gaudru, Patrick Barois, and Marc Sagot, European Volcanological Society, CP 1, 1211 Geneve 17, Suisse; Isaha'a Boh Cameroon, Media Research and Strengthening Institute, P.O. Box 731, Yaounde, Cameroon. The eruption from the S flank of Mt. Cameroon that began on 28 March was followed by the opening of a second set of fissures opening on 30 March, sending a voluminous aa flow towards the ocean that continued throughout the first two weeks of April (BGVN 24:03 and 24:04). On 11 April the flow front was 150-200 m wide and 30 m thick and progressing at a rate of several m/hour; lava production ended on 14 April. A notice on 5 June from Henri Hogbe Nlend, the Minister of Scientific and Technical Research (Ministre de la Recherche Scientifique et Technique, MINREST), said abnormal and repeated high-amplitude seismic events were recorded on the night of 30 May by seismographs in Ekona. This was the first time since the end of the eruption that such events have been registered. On July 11 the head of the Scientific Committee monitoring Mt. Cameroon, Samuel Ayongue, was quoted in The Post, a weekly newspaper, as being "...worried about the tremors going on now because they have increased in intensity and frequency." According to Ayongue, the tremors were being caused by magma refilling spaces created during the eruption. It was difficult to locate the earthquakes because of inadequate seismic equipment. The Assistant Director of the Institute for Mining and Geological Research (IRGM) at Ekona, Richard Ubangoh, disclosed on 13 October that during 4-6 October, 54 seismic events ("earth tremors") were recorded. A notice to the Minister of Scientific and Technical Research confirmed earlier reports of frequent felt earthquakes by residents living on the foot of Mt. Cameroon. A source at MINREST, quoting the notice for Isaha'a Boh, stated that the events "... were not serious [enough] to cause any damage or immediate threat." The Assistant Director regretted that "... the equipment in use presently, are quite old and cannot provide reliable results." While waiting for 10 new seismographs from Europe in the next six months Ubangoh stated that provisional equipment would be installed at the foot of the mountain in the next three months. Information Contacts: Isaha'a Boh Cameroon, Media Research and Strengthening Institute, P.O. Box 731, Yaounde, Cameroon. Mt. Cameroon began erupting during the night of 28 May 2000. On 29 May, following a violent explosion, red-tinged fumaroles were observed at an elevation of 3,300 m. On May 30, an earthquake shook the provincial capital of Buea, located to the SE of the volcano. Volcanic ash and gases that were vented during the course of the eruption were blown to the W coast by NE winds. The eruption occurred at two principle sites separated by 3 km. These sites lie on the central portion of the upper SE flank, upslope of the town of Buea and in the vicinity of vents active in 1904 and 1922. The first site, located at latitude 04°12'40" N and longitude 09°10'45" E and an elevation of 4,000 m, is composed of two craters aligned NE to SW. Juvenile material comprises less than 1% of the total volume of the pyroclastic material surrounding the vents. The larger pyroclasts were found farther away from the vent, while the finer material was deposited closest to the crater. The NE crater, with slopes that are fissured and unstable, showed relatively little activity compared with its neighbor to the SW. The eruption at the SW crater was characterized by sporadic explosions of gas and pyroclastic materials, including juvenile materials such as volcanic bombs, blocks, and scoria. There were no lava flows reported from this site. The second vent lies at 04°11'15" N and 09°10' E at an elevation of 3,300 m. This site consists of a large open fissure oriented at N 40° E. The following features at the site run NE to SW along the fissure: two lava lakes surrounded by spatter cones, two craters in the process of forming cones with fluid lava, and several hectometer-sized (104 m2) fissure lava flows. The spatter cones are about 40 m from the associated lava lake. The NE lava lake forms a 60 x 40 m ellipse. This lava lake was the source of the lava flows that moved towards the ocean to the S and away from many of the inhabited parts of the volcano's flanks. There were sporadic explosions at the lava lakes. Contrary to some media reports that suggested the lava was advancing at rates up to 20-25 m/hour, a scientist from the Ministry of Territorial Administration reported that the lava moved at ~5 m/hour. The scientist also indicated that the lava flows were far from populated areas. However, on 8 June, various news reports placed the lava flows within 5-7 km of the town of Buea. Reuters reported on 9 June that geologist Isaac Konifer Nijah, a member of a scientific team monitoring the volcano, considered the Buea area a high risk zone. Concern for the residents in this town prompted an evacuation plan for ~3,000 residents to the towns of Limbe to the SW and Tiko to the SE. However, the evacuation plan was not implemented because on 10 June the lava front halted its advance on the town. The BBC reported that on 19 June, the Prime Minister of Cameroon, Peter Mafany Musonge, visited the village of Bokwango, which is on the outskirts of Buea. News reports stated that at this point the lava flows were 4 km from the edge of the village. However, no new activity had been reported by seismologists for several days preceding the visit. Thanks to Pierre Vincent and the company ELF Aquitaine, an initially proprietary report on Mount Cameroon geology, eruptions, and hazards (including a geological map) were recently made available to the Smithsonian (Vincent, 1980). The same author has some earlier published work on this volcano (Vincent, 1971). References. Vincent, Pierre M., 1980, GNL Project in Cameroon, geology and volcanology of Mount Cameroon: Report for ELF Aquitaine (in French), 11 p., appendices, and map (plate). Vincent, Pierre M., 1971, New data about Cameroon Mountain volcano: 6th Colloquium on African Geology, Leicester, UK, April 1971, Jour. Geol. Soc. London 127, p. 414-415. Information Contacts: US State Department, 2201 C St., NW, Washington, DC 20520 USA (URL: http://www.state.gov/); BBC (URL: http://news.bbc.co.uk/); Reuters (URL: http://www.reuters.com). Heavy downpours struck Limbe (formerly Victoria), a coastal town located on the southern foot of Mt. Cameroon, during 26-27 June 2001. They led to a series of floods and landslides that killed ~23 people and rendered over 1,000 people homeless. People were buried alive as the floods and landslides reduced houses to mud. The disaster took hundreds of thousands of dollars in property and left surviving residents deeply shaken. Limbe (population, over 80,000) lies ~25 km directly S of Mt. Cameroon's summit. The town sits on the Atlantic coastal plain, an area bordered on its E and N sides by high, steep slopes of unconsolidated pyroclastic cones. Most of these cones are still geologically very young, most likely Late Quaternary in age, judging from their freshness and lack of vegetation. Other cones appear older as they have developed an appreciable soil overburden capable of supporting deep-rooted woody vegetation. The main landslide occurred in the section of Limbe called Mabeta. There it covered four houses and killed 21 people. Rescue teams deployed from neighboring towns used a front-end loader to search for survivors and to excavate battered corpses who were seen by passing residents. The floods also took a boy who had sought refuge in a coconut tree. Many other sections of the town, including Down Beach Limbe, also suffered significant losses and damage. Some news sources cited 19 people confirmed dead and an additional 15 missing. A government crisis commission was set up to handle the disaster. They were charged with finding ways to move people away from the disaster zone and resettle them elsewhere, and to propose new ways of avoiding future disasters in Limbe. Information Contacts: B. Ateba, R.U. Ubangoh, N. Ntepe, and F.T. Aka., IRGM/ARGV, P.O. Box 370, Buea, Cameroon; International Federation of Red Cross and Red Crescent Societies (IFRC), PO Box 372, CH-1211 Geneva 19, Switzerland (URL: http://www.ifrc.org/). Mount Cameroon, one of Africa's largest volcanoes, rises above the coast of west Cameroon. The massive steep-sided volcano of dominantly basaltic-to-trachybasaltic composition forms a volcanic horst constructed above a basement of Precambrian metamorphic rocks covered with Cretaceous to Quaternary sediments. More than 100 small cinder cones, often fissure-controlled parallel to the long axis of the 1400 km3 edifice, occur on the flanks and surrounding lowlands. A large satellitic peak, Etinde (also known as Little Cameroon), is located on the S flank near the coast. Historical activity was first observed in the 5th century BCE by the Carthaginian navigator Hannon. During historical time, moderate explosive and effusive eruptions have occurred from both summit and flank vents. A 1922 SW-flank eruption produced a lava flow that reached the Atlantic coast, and a lava flow from a 1999 south-flank eruption stopped only 200 m from the sea. Explosive activity from two vents on the upper SE flank was reported in May 2000. Ateba B, Dorbath C, Dorbath L, Ntepe N, Frogneux M, Aka F T, Hell J V, 2009. Eruptive and earthquake activities related to the 2000 eruption of Mount Cameroon volcano (West Africa). J. Volcanol. Geotherm. Res., 179: 206-216. Ateba B, Ntepe N, 1997. Post-eruptive seismic activity of Mount Cameroon (Cameroon), West Africa: a statistical analysis. J. Volcanol. Geotherm. Res., 79: 25-45. Deruelle B, N'ni J, Kambou R, 1987. Mount Cameroon: an active volcano of the Cameroon Line. J African Earth Sci, 6: 197-214. Fitton G, 1984. Mt. Cameroon, W. Africa. Volcano News, 18: 2-3. Fitton J G, 1987. The Cameroon line, West Africa: a comparison between oceanic and continental alkaline volcanism. In: Fitton J G and Upton B G J (eds) Alkaline Igneous Rocks, Geol Soc Amer Spec Pub 30: 273-291. Fitton J G, Kilburn C R J, Thirlwall M F, Hughes D J, 1983. The 1982 eruption of Mount Cameroon, West Africa. Nature, 306: 327-332. Geze B, 1953. Les volcans du Cameroun occidental. Bull Volcanol, 13: 63-92. Ngwa C N, Suh C E, Devey C W, 2010. Phreatomagmatic deposits and stratigraphic reconstruction at Debunscha Maar (Mt Cameroon volcano). J. Volcanol. Geotherm. Res., 192: 201-211. Nkoumbou C, Deruelle B, Velde D, 1995. Petrology of Mt Etinde nephelinite series. J Petr, 36: 373-395. Sato H, Aramaki S, Kusakabe M, Hirabayashi J-I, Sano Y, Nojiri Y, Tchoua F, 1990. Geochemical difference of basalts between polygenetic and monogenetic volcanoes in the central part of the Cameroon volcanic line. Geochem J, 24: 357-370. Suh C E, Luhr J F, Njome M S, 2008. Olivine-hosted glass inclusions from scoriae erupted in 1954-2000 at Mount Cameroon volcano, West Africa. J. Volcanol. Geotherm. Res., 169: 1-33. Suh C E, Sparks R S J, Fitton J G, Ayonghe S N, Annen C, Nana R, Luckman A , 2003. The 1999 and 2000 eruptions of Mount Cameroon: eruption behaviour and petrochemistry of lava. Bull Volcanol, 65: 267-281. Vincent P M, 1980. Geologie et volcanologie du Mont Cameroun. Unpublished Rpt, ELF Aquitaine, 18 p.
There is no Deformation History data available for Cameroon. 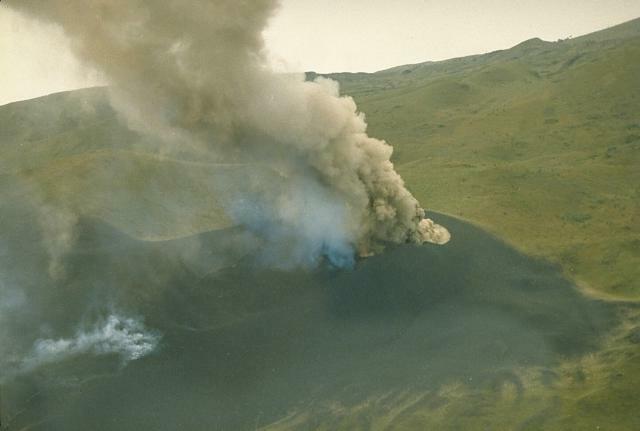 An eruption plume rises above a new cinder cone that formed on the SW flank of Mount Cameroon on October 16, 1982. The eruption occurred from a NNE-SSW-trending radial fissure at the location of an older cinder cone. A lava flow traveled 12 km down the SW flank to within about 6 km of the Atlantic coast. Two towns were evacuated, and tephra caused damage to plantations. The eruption ended on November 12. Photo courtesy of Tom Humphrey, 1982 (Gulf Oil). An incandescent lava flow splits into several channels as it advances through thick rain forest on the SW flank of Mount Cameroon. The eruption began on October 16, 1982, shortly before this photo was taken, from a fissure 6.5 km SW of the summit. Lava flows traveled 12 km down the flank to 1200-m altitude, within about 6 km of the Atlantic coast. On October 30, the flow was about 200-m wide and 20-m thick at its terminous. Steam rises from a crater and a lava flow near the summit of Mount Cameroon in 1982. One of Africa's largest volcanoes, it rises to 4095 m above the coast of west Cameroon. More than 100 small cinder cones, often fissure-controlled parallel to the long axis of the massive 1400 cu km volcano, occur on the flanks and surrounding lowlands. During historical time, moderate explosive and effusive eruptions have occurred from both summit and flank vents. In 1922, a lava flow from a SW-flank vent reached the Atlantic Ocean. Photo by Daniel Kergomard, 1982 (courtesy of J.G. Fitton, BRGM, France). Large Eruptions of Cameroon Information about large Quaternary eruptions (VEI >= 4) is cataloged in the Large Magnitude Explosive Volcanic Eruptions (LaMEVE) database of the Volcano Global Risk Identification and Analysis Project (VOGRIPA).